Just Got Better with new version 3.1 and added features ! A convenient bulk file name change / or file attribute changer . . and more. To change a number of file names or attributes quickly, ensure all of the files are in the same directory. Then let filemod change the names or attributes at very rapid speed. Changing only one file? Filemod contains an "only one" feature also. 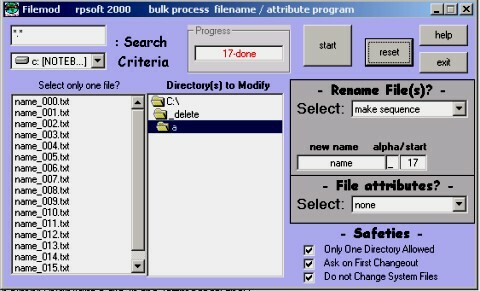 In newer versions, such as 3.0, filemod also will provide file name lists, a unique file delete command, and also help on writing over private deleted files. Filemod is able to change case of a directory of file names (or nested directories) to either all small letters, all capital letters, and even title case (capitals at the start of words for the name, and small letters for the file extension). More on this by clicking here. Ever wish to slightly modify directory file names after the fact in bulk? In directories or even nested directories? Filemod can do some of that. Filemod contains a more powerful file name change agent - a find and replace routine. This function can be used to find certain characters in your file names within a directory and change them to other characters. For example, it can modify all spaces " " in your file names to underlines "_", or do the reverse of that, or even change a name to another. This find and replace works on the whole name plus the extension, such that even extensions can be modified by this, one type at a time. More on this by clicking here. Do you have files you wish kept as they were - with no new changes? Put those files under the same directory and let filemod change those files to read-only. Concerned that someone could get through your company or home’s firewall and get to important business files? Those business files may be overlooked by a thief if they simply do not have a rational name associated with them. Filemod includes a file name scrambler / de-scrambler that can modify file names based on your simple alphabetical coding. Filemod also modifies some extension endings, including: .doc, .txt., .pdf, .htm, .html, .xls, .ppt, .exe, .bmp, .jpg, .gif, among others. In addition, filemod will also modify file attributes to hidden or unhidden - following the normal windows conventions of those attributes. More on this by clicking here. While thankfully rare, file names can become corrupt to the point where the names are no longer legal and sometimes windows operating systems will not even allow them to be deleted. Isolating those files in their own directory and using "make sequence" will usually allow the file to be modified or deleted later. Note - if one cannot move the file to its own directory, consider moving the other files in that directory temporarily out - if at all possible. Then use filemod. The attribute change "read only" is discussed above. However, filemod will also change attributes of files for: hidden, archive and system attributes - either one at a time, or whole directories at a time. system-archives example. Some of these applications are becoming hard to find in other programs. You can also simply remove all attributes from a file or a directory of files. The program will modify files for names and attributes, but not the directory names or attributes. The program is a powerful one, and one must exercise caution over and above the safeties to ensure that the files in the directories to be modified (and directories nested inside of those) are correct. Renamed files may not be recognized by programs or operating systems after the modification. Safeties are optional, but begin in the “on” position. The safeties are for (1) ensuring only one directory looked at, (2) Asking on first change out and (3) not changing system files. With care, the first safety can often be turned off in order to do multiple nested directories at once. It is suggested to leave the other two on. However, that is your option. A very powerful bulk file name changer program / attribute modifier!